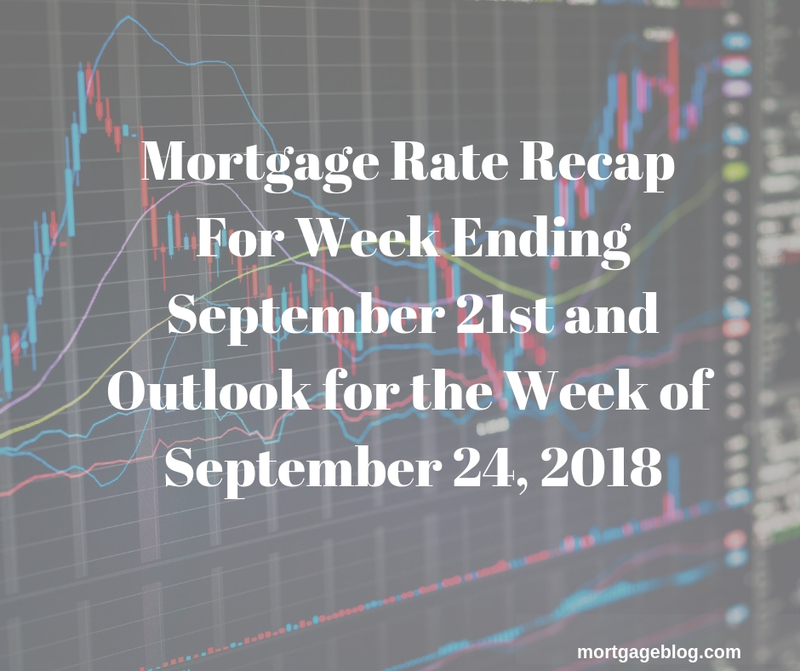 Mortgage rates have increased for the last three weeks, and there’s a strong likelihood that they will continue on that path for the foreseeable future, and definitely for the next week. Earlier in the week, there was a sell-off in the market which was justifiable – so no correction is expected. The Fannie Mae 4% coupon is now at it’s highest price in several years. Other significant economic data released was Jobless Claims 4-week moving average coming in at a new 50-year low; national median home price, now $264,800, makes 78 straight months of increase; and there was a very slight increase in housing inventory from a 4.1 to 4.3 months supply. Trade war concerns are not impacting bond traders now. Also notable – the dollar is slipping against other leading currencies, making it less enticing for investing in US Treasuries. The dollar weakened further this morning after reports that the US and Canada are unlikely to reach a deal on NAFTA. Further increases in mortgage prices will be fueled by the Fed rate hike set for next week, along with continuing growth in the economy that’s moving inflation up. This candlestick chart below covers the past weeks’ Mortgage Backed Securities (MBS) activity and the impact on interest rates. 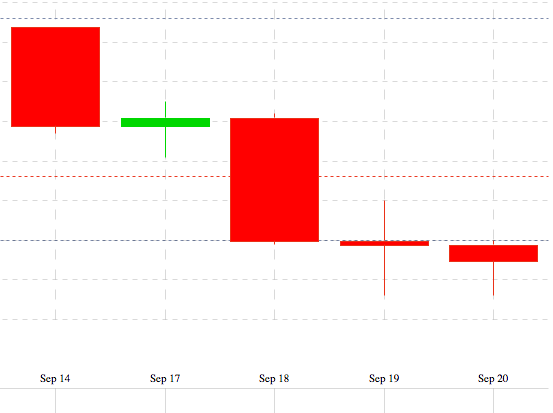 MBS started the week at 101.09 and were trading at 10.75 at mid-day September 20th. MBS directly impact mortgage rates, and the days with red indicate higher rates and those with green – lower rates. Bankrate’s weekly survey of mortgage and economic experts, countrywide, shows the majority (75%) predicting interest rates will increase this coming week (plus or minus two basis points), while 17% predicting rates will decrease. The remaining 8% expect interest rates to fall again next week. 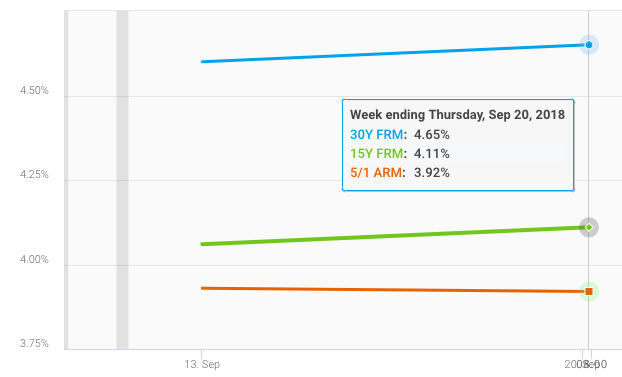 The chart below, from Freddie Mac’s weekly mortgage survey, shows conforming rates increased for the week of September 14th to September 21st, for 30Y fixed, 15Y fixed and the 5/1 ARM. Freddie Mac’s weekly mortgage survey noted, “The 30-year fixed-rate mortgage increased once again to its highest level since May. Strongly advise locking in an interest rate as soon as possible, regardless of when you plan on closing. The market is on the move up and there is no benefit to floating at this time or in the foreseeable future.